Ever since the summer Luke and I binged on the Game of Thrones audio books four years ago, I've craved an epic fantasy series in the summer. It's just the perfect time for me to really commit to something incredibly long with lots of characters and a complex magic system and all kinds of adventures. This year, we decided to give the Farseer Trilogy a try. I had low expectations based on the covers. The covers I used for the image above aren't the same as the ones on the audiobook I listened to. The audiobook covers are pretty rough. That said, I was absolutely thrilled with the series. It's dark, but not grimdark, and I felt like we really got to know the characters and the system of magic used in the series. 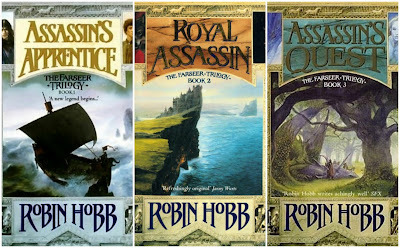 I like fantasy epics that don't skimp on characterization in favor of action, and Hobb certainly delivered in-depth characterization. My one critique is that, as with much of epic fantasy, I felt like she could have used some heavier-handed editing. Luke and I both noted how frequently she'd introduce a scene by saying something along the lines of "the day was uneventful" and then continue on to describe the uneventful day. If it's uneventful and nothing interesting happens, please don't make us read about it for fifteen pages. You can skip to the events, really. That's what we're here for. There's also a lot of repetitive description - Fitz, walking somewhere with Night Eyes (his wolf), thinking about Night Eyes, hunting things to eat, walking some more. I probably could have cut at least a hundred pages out of each book and still gotten all of the characterization, setting, and plot without missing anything. Other than the critique above, regarding parts of the book that were repetitive or unnecessary, I thoroughly enjoyed the series. Each book took me a while to really get into, but once I was engrossed in the story I couldn't stop listening. I stayed up late several nights trying to finish. No better recommendation than that for any book! If you're a fan of epic fantasy, this is an absolute must-read. I fell in love with the characters and the world Hobb creates, and luckily for me, she has several more series featuring the same characters and set in the same world. This is the starting place though - the first of her series you should read. They're very well done and are perfect if you're looking for something long and intriguing with action and deeply constructed characters.